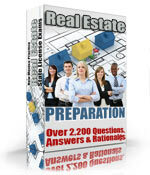 Real Estate Salesperson Exams in Florida are administered by Pearson VUE, which can be found at www.pearsonvue.com. Before taking the exam, you must complete the pre licensing education requirements. You must also have a Florida Division of Real Estate Authorization notice. This notice will most likely be mailed to before your exam date. For more information on exam registration and the real estate license application procedures, follow this link to the Florida candidate handbook. Both of the Florida Real Estate exams are based on a total of 100 points. The content of the Florida real estate broker exam is roughly 45% real estate law, 40% real estate principles, and 15% real estate math. The sales agent exam is almost the same, except there is 5% less math. The Florida Real Estate Salesperson and Broker Exams are taken by computer. You will receive your results immediately after finishing the exam. The examination is closed book. Do not bring any study materials with you to the test, as they are not permitted inside the testing area. On exam day, be sure to arrive 30 minutes early. Bring two forms of ID to the test. Also, bring your exam authorization notice and your certificate of pre-license education completion. If you do not bring these important documents to the exam site, you may be refused admission and will lose your exam fee. Remember to bring a calculator to the exam, and two sharpened pencils to work out any math problems.